Creative visualization is a process for manifesting positive changes in your life using the power of your mind and imagination. Whether it be financial, health, peace of mind, family, or career improvements, using the power of creativity and your imagination can improve and enhance all of them. 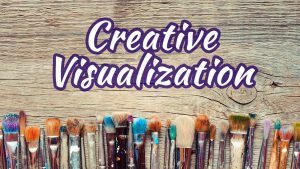 Creative visualization is not about only using wishful thinking to improve your life… It's about energetically aligning yourself with what you want using the power of your mind, imagination, and intuition. Action is still required to reach your goals, but with creative realization you can align yourself with the right actions, and the direct path to drawing what you want into your life experience. • Find a comfortable quiet place where you can have about 10-20 minutes without being disturbed. • To start, you set your intention, or define your goal. This can be something you want to manifest, or if you’re not certain what you want to create your goal can actually be determining what you want to create. • You will want to take a moment to meditate, focus on or ponder your goal to make sure it’s something you really want to create in your life, and that only positive will come as a result for you and everyone involved. • When you do have a clear goal in mind, consciously let it go for the time being. • Close your eyes, breathe deeply several times, and relax your physical body. Tense your body slightly, and then let it go. • Now with your eyes closed, imagine a clear picture of your goal or intention as if it was already manifest. • Do this in whatever way comes easily and naturally for you… You may paint the picture in your mind, feel what it is like to have what you’re creating, or you may imagine and visualize touching it, feeling it, tasting it or telling a friend about it. • Add color, feeling, emotion, and love to your visualization. Enjoy creating this vivid creative visualization in your mind, and stick with it for about ten minutes. • Return to your visualization a couple of times a day for about ten minutes each. • Strive to stay positive when you’re not visualizing, trusting that you are able to use creative visualization to create positive change in your life. • When you do have negative thoughts, doubts, or worries that come up… Let them go. Release the negative thought and replace it with a positive thought or intention. Creative visualization is incredibly effective when you stick with it, and also take action to make your visualization a reality. As I mentioned… These are just the basics, and there is actually an entire course on Creative Visualization you can get below. The best part is that you can get it for free! Just click on the link below to begin your creative visualization journey. Click Here to Get the Creative Realization Course for FREE!!! I stumbled across (or was guided to) this Creative Visualization course one day while I was looking for a way to boost my creativity. I’ve found creative visualization to be a powerful tool for not only this, but also for creating positive change in my life and gaining clarity in terms of what I want to create in my life and realizing how I can go about achieving it. Honestly, it is similar to ways in which the angels have had me visualize the things I want to create in my life… But naturally this course this has a unique spin. One of the best features of the Creative Visualization product is the layout of the course itself. It is laid out in such a manner that makes it extremely easy to follow. • Lesson 1 – Scientific Evidence of Creative Visualization: this lesson is all about explaining how your thoughts have a direct impact on the circumstances that appear in your life. This part of the course serves as in introduction of sorts and shows you how creative realization can be used to shape your life for the better. • Lesson 2 – Avoid “Realism”: this is where you begin to learn how thoughts that dictate reality are only serving to restrict your life. It shows you how, by broadening your mind and dreams, you can achieve the so called impossible. • Lesson 3 – The Advanced Practice of Creative Visualization: this lesson is dedicated on how best to express your emotions and how this links in directly with creative visualization. • Lesson 4 – Don’t Feel Guilty for What You Want: unnecessary guilt is a terrible blocker of dreams. This lesson shows you had to bypass this negative and harmful feeling. • Lesson 5 – You Must Know What You Want: it is key that you can identify what it is you are looking for in life. Without having a goal, it can be very difficult to move forward in life. • Lesson 6 – Seek Balance in Your Desires: this, in a nutshell, shows you how to best plan a step-by-step process in which you can achieve your life goals. • Lesson 7 – Stay in the Flow State: this lesson will show you how to remain in a positive mind frame and be overall happy and content whilst you work towards your goals. • Lesson 8 – The Expectancy Effect: this special lesson introduces you to the three building blocks that will supply you with the tools to create a reality that you have always dreamed of living. • Lesson 9 – Preserve What You Have Got: this final lesson shows you how to be grateful and happy with what you have while you are on the journey to making your life better. This is something that many people struggle with.